Guests of the Gaylord Opryland Resort, Nashville, Tennessee, had another reason to celebrate the holiday season with the December 1 opening of Phase 1 of SoundWaves, America’s first upscale, indoor/outdoor resort water attraction. The indoor portion of the waterpark expansion opened to the public after Aquatic Development Group (ADG) completed its work. 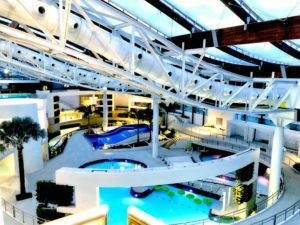 The $90 million, 111,000 square foot three-level, music industry-themed waterpark features five waterslides, a FlowRider Double, rapid and lazy rivers, an activity pool with rock climbing and more. The project received $14 million in tax breaks, with the intention to encourage tourism in the region. Currently, The SoundWaves park is only open to guests staying at the Opryland Resort who have purchased admission and is slated to operate year-round at a temperature of 84º. The outdoor portion of the project, also being designed and built by ADG, is expected to be completed this summer. It will include a 315,000-gallon wave pool. Fusing water and music with amenities and activities, SoundWaves offers an experience unique to Music City. A modern design, sleek finishes and thrilling rides intertwined with living walls and plant beds create an alluring ambiance. A uniquely-designed roof permits natural light, giving guests the opportunity to sunbathe indoors year-round. The indoor facility is located next to the hotel’s 9-acre Garden Conservatory.